In recent years airlines have gotten tight about the amount of luggage you can bring on board without paying extra fees. Now the consumer apparel market has responded: A startup called Jaktogo is making "wearable" luggage that lets you sneak an extra 30 pounds of stuff onto a plane by wearing it on your body. 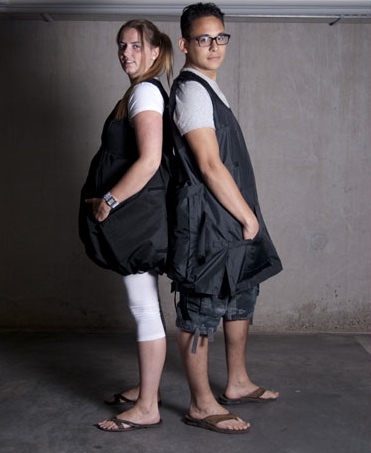 Jaktogo, which has been operating since 2010, makes three versions of its product, the original Jaktogo with 14 various-sized pockets, the sleeveless "Ponchotogo," and, for ladies, the "Dresstogo," which Jaktogo describes as a "balloon shaped skirt." Jaktogo is a very practical kind of product which is both its appeal and its main drawback. Sweatpants are practical, and fanny packs are practical, but wearing either sends the off-putting message that you're willing to stand outside of society in order to boost your personal convenience. The same may be true with wearable luggage.